It may have taken considerably longer than anyone anticipated, but it looks like Simon & Schuster has finally followed through on the ebook price-fixing settlement. I've just noticed that the Amazon website has been updated with new prices for books published by S&S, and any mention of the prices having been set by S&S has been removed (example, example). At this time it doesn't appear that B&N or Kobo has followed suit, though I am seeing comparable prices in iBooks. 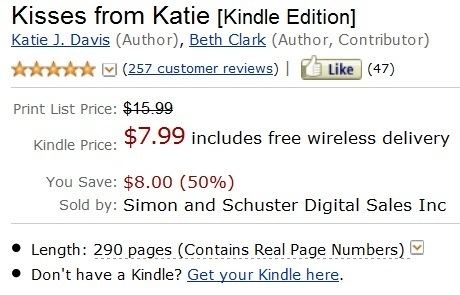 Thanks to the 3 month-old anti-trust settlement, the US ebook market is getting more and more complicated. It's a pity that I cannot say the same for the rest of the world, where agency pricing still holds sway. It's been just 5 days since Hachette ebooks lost their publisher imposed fixed prices, and a day under 3 months since HarperCollins did the same. All these changes to pricing policies are a result of Judge Cote approving the anti-trust for the anti-trust prosecution in September of this year. Earlier this year the US government (as well as 49 state gov't) sued 5 publishers and Apple, accusing them of colluding to fix ebook prices. Three of the publishers have settled, and as of today they have all changed their ebook pricing policy to release ebookstores from the pricing restrictions. Apple as well as Penguin and MacMillan have decided to fight it out in court. That case won't go to trial until June 2013. Penguin is the worst of the lot. I can’t believe they’re trying to fight it when they charge $10 for an ebook that was never available in hardback. I can understand paying more for an ebook the day it is released if my only other option was a hardback. To non-readers I equate it to going to a movie theater instead of waiting for the title to go to DVD. BUT when a movie is a ‘straight to DVD’ title I don’t expect to pay theater prices!